The Granary01263 715779work01603 870304fax Self-cateringAn absolutely stunning barn that is the perfect place for a destination holiday. Celebrate big birthdays, anniversaries and so much more in this beautiful holiday home. There is plenty of entertainment on site with a tennis court, a hot tub and 33 acres of countryside to amble in. The barbeque area features both a gas barbeque and a charcoal pizza oven for budding cooks. Archery lessons can be arranged, livery stables are nearby and private catering can also be accommodated. Many of the bedrooms are on the ground floor, there are plenty of en-suite facilities and towelling robes, slippers and TV's are in all the bedrooms. Luxuriously decorated, with two lovely spaces for either dining in or eating alfresco, there is also a garden room overlooking the courtyard garden and decking overlooking a tranquil pond. A stay here will take you out of the rat race for a while - stay calm, relax and re-charge the batteries! • Outdoors: Enclosed courtyard garden with garden furniture and dining table for 14. Extended garden with lawn, Barbecue, Charcoal Pizza oven, Hot tub, pond with decking, access to owners tennis court - racquets and balls supplied, bike storage available, livery available by arrangement with the owners. You may need to pay an Accidental Damage Deposit for this property. Where applicable we will contact you in good time before your holiday with further details and to take payment. 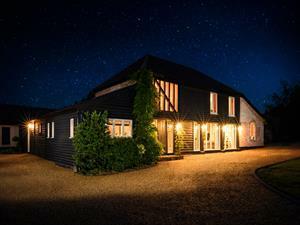 An absolutely stunning barn that is the perfect place for a destination holiday. Celebrate big birthdays, anniversaries and so much more in this beautiful holiday home. There is plenty of entertainment on site with a tennis court, a hot tub and 33 acres of countryside to amble in. The barbeque area features both a gas barbeque and a charcoal pizza oven for budding cooks. Archery lessons can be arranged, livery stables are nearby and private catering can also be accommodated.